A Pig of Success: Dairy. Babies. Earthquakes. The much-anticipated CAVU baby arrived on Monday night, and she is a beaut! Plus, everyone likes to feel useful, and the current preferred outfit is a tiny pink onesie from Hanna Andersson that I bought... (thanks to K!)... H.A. makes the most awesome, functional, long-lasting and not ugly organic cotton kiddo clothes. There are no jump-roping frogs or singing airplanes or "Mommy and Me Love You!" taglines on them. And the healthy little princess looks great in her pale pink onesie, IMHO. 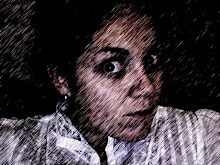 Like, my first one where I was awake. And the first one where we were all talking and stopped, and my chair was rocking around a bit, and it went on for a while, and we had time to talk about it. It was scary and totally awesome. It really shook the sliding glass doors and was a tad scarier, only because I had time to think, "Uh, are these quakes building up to a Big One?" 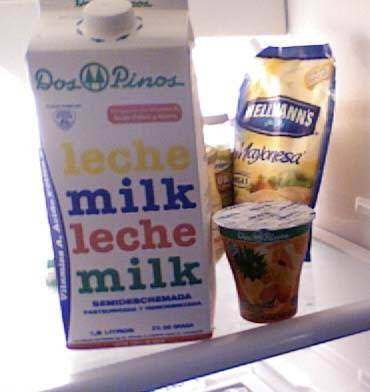 And finally, in today's collection of random notes, Costa Rican dairy products. As you can see in the picture above, if you want milk, you can buy MILK/LECHE. But I challenge you, if you're a skim milk drinker, to find that. Or 1%. All milk here is MILK/LECHE. Now, I love full fat dairy. I think it's good for your brain, and when a dear cousin of mine was undergoing cancer treatment, she had to stock up on full fat dairy in preparation for the incomprehensible challenge of the treatments. I take this as a sign that full fat dairy is great for humans, and so the milk is NOT a problem, but please allow me to introduce the little container next to it. Costa Rican yogurt. So I ate some descremado yogurt - skimmed? (De-creamed?) It was fine. It was normal yogurt. Then I wanted to try the orangey tropical looking kind, and I only half-noticed that it was NOT descremado. It's not like Greek yogurt, or sour cream, both of which I love, though it is similarly decadent. It's somewhere between the mouth feel and hedonism of melted ice cream, but the balanced flavor and slight sweetness of a tangy, fresh yogurt. It's full fat dairy at its very, very best. I'm off to have one now. you're on the right track with the skimmed & de-creamed; descremado = low-fat. and that yogurt sounds GOOD. i've started making my own yogurt at home, and the last batch came out decadently. i only hope i can repeat it next batch! Wait, how does one make their own yogurt!!!??? OK, but if you run across carbonated yogurt (I think it's a Middle Eastern thing) JUST SAY NO! That stuff is not good no matter the delicious fat content. @ Kelly: the yogurt making is shockingly easy. all you need is milk, a yogurt starter with live active cultures (which can be a store bought cup of plain yogurt. i used stonyfield farm. ), and if you want to thicken it up a little, some non-fat dry milk. you heat the quart of milk to just below boiling to kill any unwanted bacteria (pasteurization! ), add in the 1/3 cup of dry milk if you're using it, cool it to around 110 degrees (i use my kitchen sink filled with cold water), mix in your yogurt starter (making sure the milk isn't still too hot; if you kill the cultures it doesn't turn into yogurt) and incubate it at 110-115 degrees for 4 to 6 hours. the longer you let it ferment, the more tang your yogurt will develop. transfer yogurt to fridge, let set overnight, and you have homemade plain yogurt! keep a cup of it as a starter for the next batch and you can flavor the rest however you like. my batch that turned out extra awesome? i used organic, non-homogenized, cream-at-the-top 2% milk, with no dry milk added, and let it incubate for just under 6 hours. thick, creamy, and delicious. i bought a yogurt incubator thingie online so i don't need to worry about maintaining the temperature. from pouring the milk into the pan to getting it into the incubator takes about 25 minutes, and then it's just sitting around till you transfer it to the fridge. Flying to Panama Like A Rock Star. My Office and A(nother) Trip! One Thing Makes Sense! Or, The Farmer's Market. Sounds I No Longer React To.